Karl X Johan - Flames (dir. cut) from Gustav Johansson on Vimeo. Check out this story told entirely through quick macro shots by Director / Editor: Gustav Johansson. With the increase in popularity of video applications like lumify / Spark and the affordability of equipment / editing software, it’s interesting to see how many traditional design agencies have added video to their capabilities to help reinforce messaging. The evolution is fascinating. I recently connected with a few companies who’s core offering is video. Interestingly enough, they all position themselves differently which I love. Some of them don’t even identify what they do through text. Instead, they show you a reel that blows your mind. Digital arms of studios are evolving and the lines between design, video and analytics are becoming more and more blurred. 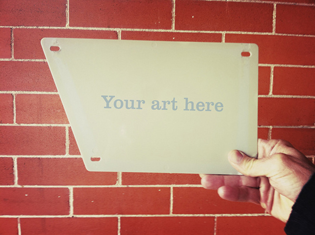 The idea of creating and fostering great creative through technology has always been fun, but now it just seems more interesting because the end result is sexier. VSCO Keys turn your keyboard into an image editing dashboard for lightroom v3/4. Cue the moment you first saw a Creative Director wizard around with a Bamboo Stylus like a Ninja! Check out this video to see how it works. Coltrane Curtis talks about the influence of Jazz musicians on his personal style. You’ve gotta check this out I’ve been anticipating this since the teaser came out months ago. A new video created by Microsoft shows how the company imagines technology will progress in the future, with mobile devices and interactive touch screens playing an even bigger role in our lives. Simply put, this is the coolest thing I’ve ever seen. A COMMON STORY from m ss ng p eces on Vimeo. A great commentary on advertising and the business of imagining the future by discovering a new agreement between consumers and corporations. It’s impossible not to be inspired by this guy and this entire movement. I’m a huge proponent of what they preach and I hope to get involved some day soon. In an “AdAge” when most art is turned to ads it’s great to see www.fearlessrevolution.com/ change things up. 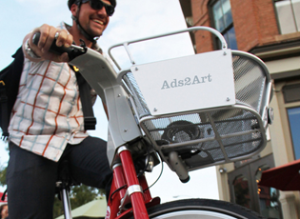 The baskets on 50 Boulder B-cycle bikes will be transformed from advertising space into art space. This gets my vote for a Crystal Lion. Click HERE to read more. San Diego agency, VITRO, create a 72 square foot floating shoe for the new ASICS Blur33 sneaker campaign. VITRO used colored lightweight balls on strings along with a lot of air power to create the floating shoe. Cool song, too – “Gentlemen’s Gold” by Neon Plastix. How cool is this? Check out this spinning interactive adiVerse Virtual Footwear Wall! It puts 8,000 shoes at shoppers’ fingertips. Designed by Start Creative, the wall renders products in 3-D, and allows a shopper to spin and zoom in on the shoes, and call up specs from a touch-screen display. You can even get product reviews, twitter comments and pay with your phone. Cue the George Jetson smirk! 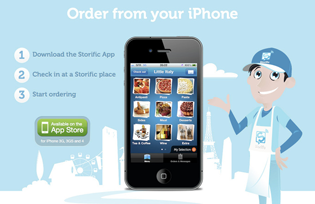 The quick and dirty is that Storific enables customers to place orders at restaurants, cafes and bars using their iPhones. Love the idea and what the app has the capacity to transform into if a Microsoft Surface option is available for people without smartphones. Not a huge fan of the logo (Skype meets Twitter) or the name but if Storific adds aGrubHub, CityMint [iTunes link] and SnapFinger feature, partners with OpenTable and handles how customers order without an iPhone I think the company could be headed for what is no doubt the future of ordering food. I partner with the industries creative economy to build brands, products and digital experiences.